Remakes used to be the stuff of true terror for me. On the whole they were terrible, or merely rehashes of the original film pointlessly recreated. There have been some good remakes. Dawn of the Dead, and Halloween spring to mind. There have been terrible remakes, such as the pointless shot for shot remake of Psycho, and the decidedly average 1990's Night of the Living Dead remake. I was in two minds on whether A Nightmare on Elm Street would be any good. The plot is almost identical to the original. A bunch of kids are being killed in their dreams by a burnt man wearing a stripy jumper, fedora, and armed with a spiked glove. It is down to two kids - Nancy, and Quintin to figure a way to stop the killer known as Freddy Kruger. To be honest, I found the first hour of this film extremely boring, it was only when I accepted the fact that the film was devoid of hardly any original ideas that I settled down and began to enjoy it. Firstly let's talk about Freddy Kruger. I couldn't imagine anyone but the legend Robert Englund playing Freddy. For the remake Jackie Earle Haley dons the burnt look. He brings something vaguely different to the table. Englunds Freddy was manic, taking great delight in his inventive killings, and full of wise cracks that got worse as the series progressed. His Freddy was able to change his appearance (such as having super long arms, and in later films turning into vehicles, and robots and the like). It was insinuated that his Freddy was a child molester and murderer who was the victim of a mob attack after he got off the charges against him due to a technicality. Haley's Kruger is a much more mellow killer, he isn't wild and unpredictable like Englunds killer. He kills his victims directly, and doesn't deviate from his realistic human look. He still wise cracks which I hadn't expected, and admittedly some of his wise cracks are quite funny (such as when character Chris sees her dead sliced open Dog: Freddy goes 'I was only trying to pet him!'). 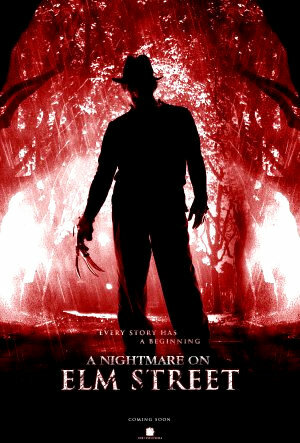 In the remake Freddy was a gardener at a children's school, he was hunted down and murdered based on the children's confessions to their parents about what he had done to them. Haley's Kruger tries to be more edgy and dark, mainly by swearing lots and lots, and wisecracking in a deadpan serious way rather than excitedly. What was cool was that the film kinda tricked the audience for a bit. It wasn't clear for a large chunk of the film if Freddy actually had committed any crimes during his life, or if it had just been the lies of the kids. 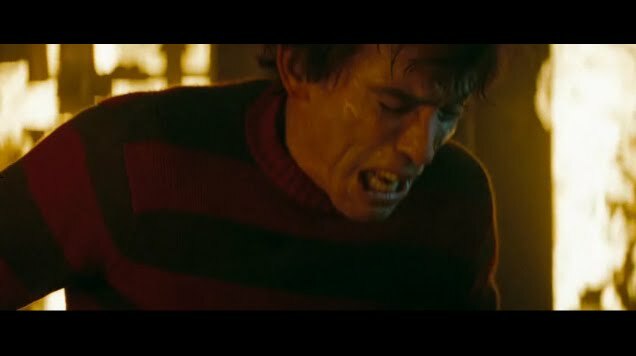 It would have been cool if Freddy was getting revenge for his wrongful murder rather than just getting revenge for having being caught. Kruger is quite cool, and is probably the best part of the film. The main problem is that there are no new ideas. If you have seen the original then there is nothing new to see here. Victims are killed in identical ways. There is the character who is killed in her bedroom by being flung at the walls before being sliced open (bizarrely better done in the original), there is the girl in the bathtub who has Freddy's spiked glove appear out of the water between her legs, and just general slashings. 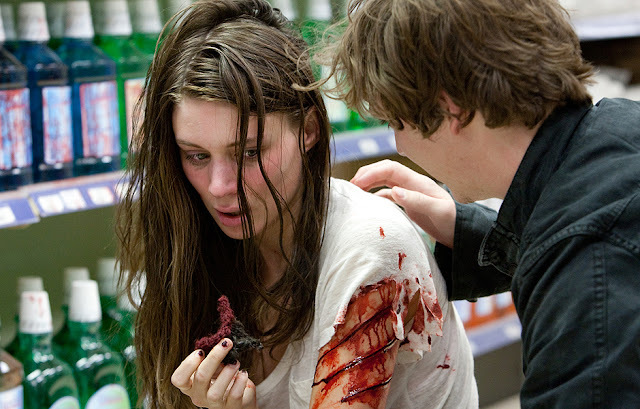 Rooney Mara plays Nancy in this remake. She does a good enough job at looking insanely tired, and an unlikely heroine, the actor who plays Quintin I did not like though; his eyebrows are so damn thick! seriously it was off putting! Other actors are ok, but really there were few standout performances. If you have not seen the original then I would recommend seeing this. If you are familiar with the original then this film may be a bit boring to be honest. Also the film relies on jump scares far too much, I got sick of them all, though the shock ending was quite fun, though expected. To be totally different they should have followed Rob Zombies cue and made the film ultra dark and violent!